Shame on Donald Trump for scaring this little girl! Hooray for these members of the U.S. military for protecting her! Veterans and current service members are using social media to reassure Muslim Americans that they will fight for their rights as citizens. On Facebook and Twitter, military service members and veterans have started using the hashtag #iwillprotectyou after one mother’s post went viral about her daughter’s fear of being kicked out of the country. Melissa Chance Yassini posted about her daughter’s reaction to hearing proposals by Donald Trump to ban Muslims from entering the country. Yassini’s post went viral and was shared more than 20,000 times. Eventually she and her daughter told their story to The Associated Press. Kerri Peek, an Army veteran saw the story on social media and was horrified. Peek said she was especially upset that Sofia was worried about soldiers coming to take her away. “What’s a way [for her] to know that soldiers are not going to come to her door,” Peek told ABC News, who eventually sent her a picture of herself in her Army uniform. But Peek didn’t stop there, she asked her friends to continue to send Sofia messages of support. 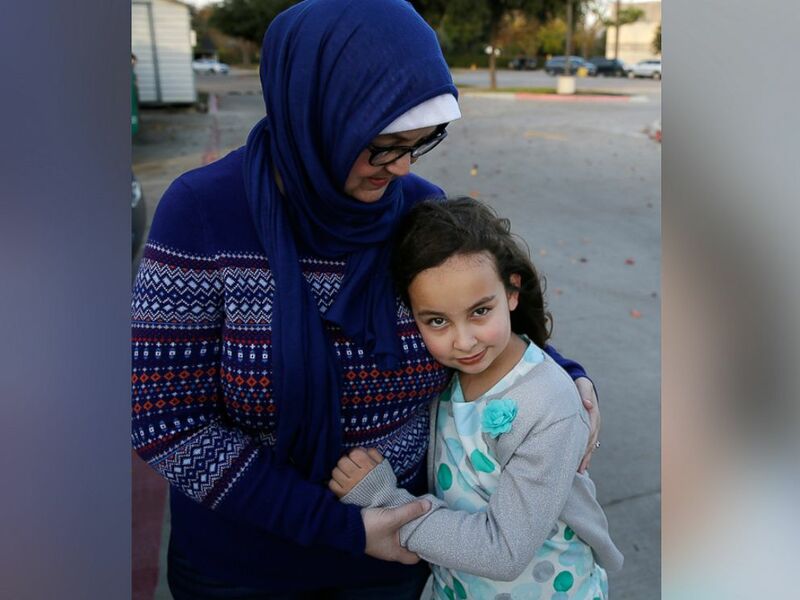 She started a hashtag, #iwillprotectyou, last Wednesday and implored other military service members and veterans on social media to pledge to protect Muslim children like Sofia from being discriminated against. “Post a picture of you in uniform with the hashtag ‘#WillProtectYou’ to let these children know that we will not hurt them. That they are safe here in America,” she wrote on Facebook. Peek said she has now received hundreds of messages from people who shared their fears over discrimination or who pledged to support others’ freedom of religion. The hashtag has quickly gone viral with veterans and service members posting pictures of themselves on social media offering words of support and comfort to Sofia and other children who are Muslim. Peek said she has even heard from Yassini about Sofia’s reaction to the new viral hashtag. “She said she’s been reading the posts to her daughter and her daughter feels so much better knowing that she’s a part of America,” Peek said. Peek says she has now set up a Facebook page for people to voice their support and hopes the group will continue to grow. Sofia, #Iwillprotectyou, too, with voice, pen, name, sweat, and blood. I meant my oath when commissioned. I mean it now. USAR ’90-’01. December 23, 2015. Tags: #iwillprotectyou, Donald Trump, i will protect you, Immigration, Islam, Muslms, News, Religion, Sofia Yassini, U.S. military. Military, Religion. 4 comments. These Muslim passengers could have taken the cowardly route and told the Muslim terrorists which passengers were Christian, but instead, they bravely refused to do so. Hooray for these brave Muslim passengers! MOMBASA, Kenya (Reuters) – Somali Islamist militants sprayed a Kenyan bus with bullets on Monday, killing two people, but a passenger said he and fellow Muslims defied demands from the attackers to help identify Christians traveling with them. Sheikh Abdiasis Abu Musab, al Shabaab’s military spokesman, said the group had fired shots at the bus. Kenya’s long northeastern border with Somalia is widely considered a security weak spot. Factors include poor coordination between security services, and a culture of corruption that allows anyone prepared to pay a bribe to pass unchallenged. December 22, 2015. Tags: Christianity, Christians, Islam, Islamic terrorism, Muslims, News, Religion, Terrorism. Religion. Leave a comment. Why not replace the corporate income tax with a tax on carbon dioxide emissions? I support a revenue-neutral carbon tax on each ton of carbon dioxide emissions. Start the tax at a low amount (perhaps $5 per ton), and then increase it by some small amount every year (perhaps $2 per ton). And use that tax revenue to lower other taxes by an equal amount. I dare Democrats to push for such a policy. And in order to get Republicans to go along with it, the tax that gets lowered could be the corporate income tax. We could eventually repeal the entire corporate income tax, and replace it with a carbon dioxide tax. If Democrats are truly against global warming, and if Republicans are truly against the corporate income tax, then what possible objections could they have to this proposal? December 21, 2015. Tags: Carbon tax, Climate change, Corporate income tax, Economics, Environmentalism, Global warming, Politics, Pollution. Economics, Environmentalism. 8 comments. Steve Harvey made a mistake. Who hasn’t? What I got from this more than anything else is that Steve Harvey admitted that it was his fault. He showed the audience that the correct winner was on the card, and he said it was entirely his own fault that he said the wrong thing. He didn’t make excuses, and he didn’t try to blame it on someone else. I admire him for that. December 21, 2015. Tags: Miss Universe, Steve Harvey, Television, TV. Television. Leave a comment. I just added items #1,162 through #1,172 to my list of Obama’s lies, lawbreaking, etc. December 15, 2015. Tags: 2016 election, Barack Obama, Benghazi, Economics, Guns, Hillary Clinton, Liberals, Medical marijuana, News, Obama, Politics, Taxes. Barack Obama, Politics. 8 comments. I recently added items #1,151 through #1,161 to my list of Obama’s lies, lawbreaking, etc. The tech support people at wordpress said my blog post had become too long for a single entry, and suggested that I break it up into multiple entries. So I did exactly that. December 14, 2015. Tags: 2016 election, Barack Obama, Benghazi, Economics, Guns, Hillary Clinton, Liberals, Medical marijuana, News, Obama, Politics, Taxes. Barack Obama, Politics. 5 comments. MSNBC host Melissa Harris-Perry criticized the New York Times because it actually had the nerve to publish a photograph of a person that it wrote an article about. Can you imagine such an atrocity? A newspaper actually published a photograph to accompany one of its articles! Has the New York Times no shame? Damn those anti-Muslim bigots of the New York Times! But seriously, what was the poor paper supposed to do? Should the Times have photoshopped the hijab off Malik? Harris-Perry might have complained that the paper was suggesting there was something offensive about the garment. Sometimes you just can’t win with the PC crowd. December 5, 2015. Tags: Media bias, Melissa Harris-Perry, MSNBC, New York Times, News, Tafsheen Malik. Media bias, Political correctness. 12 comments. nerdgirl20 is a Canadian film student who owns about 500 or 600 movies on DVD, and plans to talk about all of them. She’s says there will be about 12 videos in this series, and she asks viewers to point out the movies that they themselves own. In this first batch, the only one that I own is Witness. I’m sure I’ll have a lot more when she gets to science fiction and fantasy. December 4, 2015. Tags: DVDs, Movies, Movies on DVD, nerdgirl20, Videos, YouTube. Movies. Leave a comment. The tech support people at wordpress said my blog post had become too long for a single entry, and suggested that I break it up into multiple entries. So that’s what I’m doing. December 4, 2015. Tags: Barack Obama, Obama, Politics. Barack Obama, Politics. 1 comment. December 4, 2015. Tags: Barack Obama, corporate welfare, Government waste, Green Party, Libertarian Party, Medical marijuana, Obama, Obamacare, occupy-wall-street, Police state, Politics, Rule of law, Solyndra, U.S. Constitution. Barack Obama, Politics. 9 comments. December 4, 2015. Tags: Barack Obama, corporate welfare, Government waste, Green Party, Libertarian Party, Medical marijuana, Obama, Obamacare, occupy-wall-street, Police state, Politics, Rule of law, Solyndra, U.S. Constitution. Barack Obama, Politics. 1 comment. Poll: Did you know that 17 people were shot at a New Orleans playground a week ago? I didn’t know until just now. New Orleans police were hunting Friday (Nov. 27) for Joseph “Moe” Allen, 32, the first suspect to be named in the Bunny Friend Park shooting that injured 17 people. And they are pleading for people who were at the Upper 9th Ward playground to come forward with information. Despite the crowds at the park when the gunfire erupted Sunday evening, no one there had sent videos to police, Mayor Mitch Landrieu said. “And everyone knows there are lots,” he said. “We need videos. We need photos. We need people to come forward,” police Superintendent Michael Harrison said. Two groups of people turned their guns on each other, and police found as many as 70 bullet casings just the next morning. No shooters other than Allen have been identified by police. The mayor warned that anyone harboring Allen also will be prosecuted. “All of us are going to work around the clock,” Harrison promised. Allen, 32, faces 17 counts of attempted first-degree murder. Orleans Parish Sheriff’s Office records show he is a convicted felon with a rap sheet dating from 2002. It includes home invasion, carjacking, illegal carrying of weapon and possession of cocaine and heroin. At a Friday afternooon news conference, officials sidestepped several questions, including whether they had identified the musical group that was said to be recording a video at the park at the time of the shooting and whether Allen belonged to the gang family that includes the father of murdered 5-year-old Briana Allen. However, Harrison did say Allen has ties to more than one group. Sheriff’s Office records show Allen was arrested in 2002 with Travis Scott, who recently pleaded guilty to a federal racketeering charge as the ringleader of the FnD gang, named for Frenchmen and Derbigny streets. Harrison said all but one or two of the Bunny Friend Park victims were in “fair to good condition,” and no one’s wounds were life-threatening. “We are so glad that it wasn’t worse,” he said. December 4, 2015. Tags: Crime, Guns, mass shootings, Media bias, New Orleans, News, Politics, Polls. Guns, Media bias, Politics, Polls, Violent crime. 2 comments.